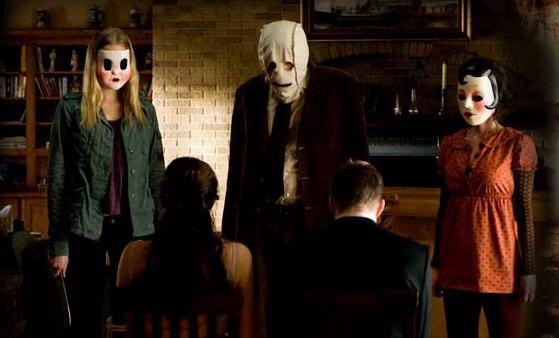 The Strangers, released in 2008 and directed by Bryan Bertino, is an underrated horror film. It is a film that clearly used the less-is-more approach during production. Besides four ancillary characters (Mike, Mormon Boy 1, Mormon Boy 2, 911 Voice Operator), the movie centers on the harassment of a not-so-very-happy-couple (James and Kristen) by three very dangerous and sadistic masked assailants. The movie opens with a lover’s quarrel between James (played by Scott Speedman) and Kristen (played by Liv Tyler). Apparently, she said “no” when he proposed to her and yet they decided to keep their original plans – even with the denial of all denials – and decided to stay at an isolated retreat over night. Too bad for the couple (especially James), the night definitely did not live up to their original expectations. In the midst of their arguing, strange events began taking place around them. Items (like phones) went missing. Creaks were heard throughout the house. A strange woman came to the house way past the witching hour. The amazing thing about this film was the amount of suspense that is created. For nearly 80 minutes, the audience sees glimpses of the intruders. Viewers are ready at almost every second for someone to jump out and grab one of the two main characters. And although the suspense was thick, no one ever really jumped out and grabbed the intended victim. It isn’t until the last ten minutes of the film that James and Kristen are shown to have fallen prey to the intruders. They are bound to separate chairs and ultimately are brutally stabbed by the menacing criminals. This movie could have easily been told in under an hour, but Bertino did a wonderful job of stretching out the suspense without making it feel as if you, yourself, was tortured. It was the right amount of stress and tension. As a fan of bloody and fast paced horror, this film was out of my typical zone of entertainment but more than ten years after its theatrical release, The Strangers can still make viewers feel vulnerable even if they are in their own home. Jeepers Creepers 4 Is Now In Development.